How's it going? Honey, I've been really busy lately with work, commuting, writing, and building my brand and what not. You have so been on my Things To Do List. I've meant to reach out to you for quite some time, but we continue to play phone tag, miss emails and the whole nine. But that's neither here nor there. How's it really going girl? Good! Yeah! Me too! Honestly though Oprah, people miss you on daytime television and these life classes are giving folks their Oprah fix. *sigh*....but can I give you the deal....you know from Reginia to Oprah. Oprah, I don't know about EVERY area, but I do know in the Atlanta area, the OWN Network is extra. Girl with Comcast, and I can only speak for Comcast in my area, OWN is in the extended basic package and Oprah that's extra. There's the Triple Play Package that most middle income folk have (you know, your viewing audience) and the Triple Play gives us internet, phone, and cable for about $100 a month, plus an extra $30 for the REQUIRED boxes, fees, and taxes. Now you're pretty hip politically, so you know middle income folks are pretty tight right now, so adding on the extended basic package is just not in budget. It's not that I don't want to support OWN, because I do. I want to blow those Neilsen ratings right out the box but I just can't add that to my budget you know. So, I dig the Oprah's Life Classes, via the net and Facebook (remember no wall) lol, but girl I just can't add the extended basic right now. Maybe you and your team can call the Comcast folks and rearrange some things....because in my opinion....network TV is nothing without Oprah and Comcast is nothing with network programming. See how that works. PS...Umm, I'm planning a breakfast for the Original BGC...(Original Brown Girl Crew). That's me, you, Gail and Michelle O. I know Michelle called you about me having a little chat with her. Regina..your letter to Oprah is classic because it's so true. Thank goodness the hubby and i have the hookup from his cable buddy. Oprah work it out! The llifeclass is so good though isn't it..i have to blog about it more! 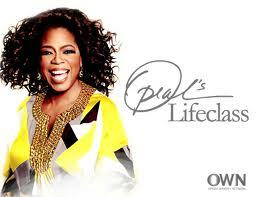 I miss Oprah and while I don't watch the lifeclass because I don't get OWN through my cable I am sure it is good! so classic! love your letter to oprah and i hope girl friends listens and hooks you up! Awesome letter! So sad that I have not watch the life classes yet. I am still rolling on what I learned from the conference! I want to come to that breakfast! beautiful!!!! i'm following you! !if you like mine, do the same!!!! and the life class has been so incredible! Great letter! I just started watching Lifeclass this week and I am hooked. I was thinking about downgrading my cable, it's becoming too expensive so I guess I might loose OWN when I finally. Loved your letter to Oprah! I haven't watched much of her channel, because it's just not the same as watching her show! The life classes sound amazing though! Take care and enjoy the rest of your day! This letter was too cute!!!! Gobble Til You Wobble - Happy Thanksgiving.